Haven’t been able to blog much for a long time. Seems like this is the story of my life this year. And that is ok. The thing that bothers me about this is that neither do I have time to visit other bloggers. A huge shame. I hope I will be able to get back on track within a month or two. Nothing serious has happened, I am simply just too busy at work, and have a couple of extra jobs these months a couple of evenings a week. So when I am finally off, I am off. This also means that I haven’t read that much. This is not exactly true, since I’ve read a couple of Danish books, and since they are not translated into English, I’ll just review them on my Danish book blog. But I’ve read one (huge) book in English since I was last blogging: The Passage by Justin Cronin. The Passage is a long one, and even though I was caught up in the story almost from the beginning, there were times where it dragged a bit. Well, no, that is not exactly how it was, it didn’t drag. It was more that I was sort of confused, and was thinking: How will this story end?! Can it end? Who is who and where are we now? But I have to say, that things come together just fine – although this is just the beginning of a trilogy. But there wasn’t that many questions left unanswered. It was a great read. It is a huge dystopic, apocalyptic fantasy. And it is not really about vampires. Not vampires as we know them, that is. Not zombies either. But then again, it is about vampires/zombies. And about a world gone almost completely under. Only inhabited by a few people. The Passage is about how and why the world came to look like it does in this book. The Passage is also about how those few living people deal with a world, where the lights have to be on a night, every night. It is about Amy, who is being born to Jeanette and a travelling salesman father. How Amy comes to live with nuns and how she travels through America after this. A part of her journey she travels with the FBI agent Wolgast, later she travels on her own. And the Passage is also about how an experiment and the search for a cure for death goes wrong. More wrong than what mankind could ever imagine. We meet a large cast of characters from our time (or rather from a time a few years forward) and from a time in the future, a time no one would want to live in. 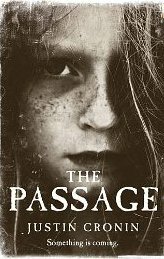 If you want something epic, and if you like the dark, dystopic and apocalyptic tales, then you should read The Passage. I was caught up in this book and it most definitely made me shiver from time to time; however, it may be some pages too long. This and the fact that it is too heavy for it’s own good (e-readers would be perfect for this one) are my only complaints about The Passage. The European cover is much more fabulous and spooky than the US cover! I probably would've caved by now if I'd been seeing that cover every time I walked into a bookstore! I think it may be a bit too long for me at the moment and it concerns me that a few bloggers have said it drags a little. @Jill, yes, I also think that is it spooky, that cover. And even though I am not spooked that easily, some passages (!) in the book really did spook me! @Vivienne, it does drag a bit from time to time. But overall it was a great read. On another day I might now have felt inclined to read such a big book, but on the other hand, it was very easily read. I listened to it on audio (35 hours!) and really enjoyed it – I am not sure if I would have made it through the book. Love the cover too. And I'm still on page 200 – I need to pick this up again. Glad to see you posting. I already have this on the top of my TBR list. It looks amazing and EPIC! !